It’s been a while since I’ve tried these products, so I’ll rely mostly on memory. I have a sharp memory, at least when it comes to products I liked, so I guess this will be easy. 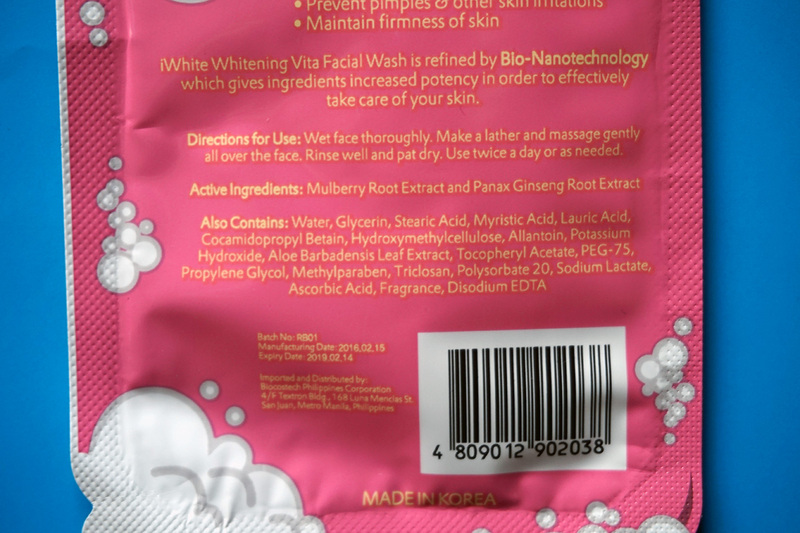 Here are capsule reviews on a few iWhite Korea products I’ve tried — the Whitening Vita Face Wash, Aqua Moisturizer, and Nose Pack. I still have the Whitening Vita Face Cream and haven’t used it up, so I’ll save a separate review for it. 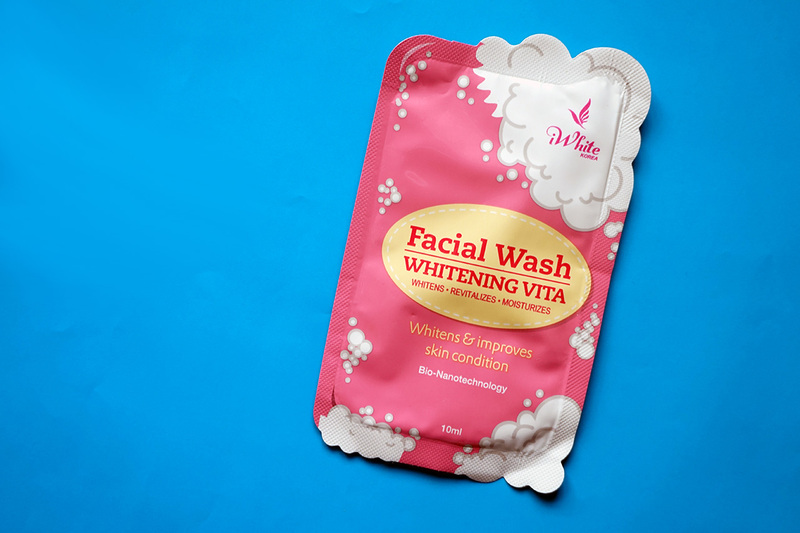 The iWhite Korea Whitening Vita Face Wash (P18) promises to whiten and improve the skin condition using Bio-Nano Technology. I mean, I’m skeptical about products that claim they use a certain type of technology, which supposedly makes their products more effective than others especially when they don’t explain what the technology really does. A couple of the results you can expect after using the product for some time are firmness of the skin and fewer pimples. Now, I only used this product ’till the sachet was emptied, but I can attest to it being effective at keeping pimples at bay. As for making the skin firm, I highly doubt it would do that even after you use it for a long time because the product doesn’t stay long on the skin. Below is the product’s ingredients list. I can’t seem to recall how this smells, but I don’t remember it being unpleasant. The consistency is the same as most cleansers I’ve used, which is cream-like. It lathers up nicely, and is easy to rinse off. Compared to the Cathy Doll Acne Solution Serum + Foam Cleanser, this leaves my skin feeling hydrated and plump after wash. 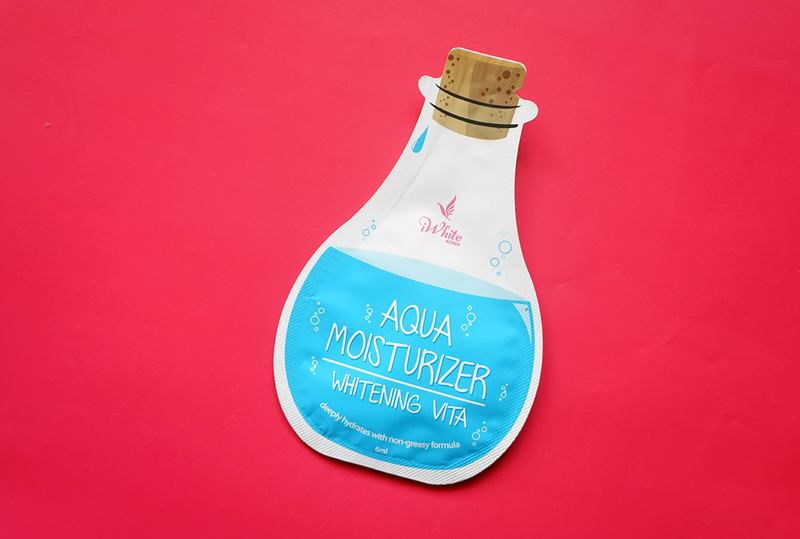 The iWhite Korea Whitening Vita Aqua Moisturizer was something I picked up as a recommendation by my friend, Rae. Now, I know why she likes it. It’s a lightweight moisturizer that’s straight to the point. It works great for people who have oily skin. The only problem is, my skin’s dry. As much as I loved the smell of this product — I told my husband it smells like a grandma who goes to her grandkid’s PTA meetings. Haha. — I found its moisturizing powers to be inadequate for my parched skin. So, I won’t be repurchasing this. If you’re oily, though, definitely give this a go. I’ve tried the iWhite Korea Original Nose Pack for a couple of times now. It’s not as stellar as other peel-off products, but for P18 it does get rid of some of the gunk from your nose. I know it’s bad, but I am oddly satisfied by these types of things. (And yes, I like Dr. Pimple Popper, too.) I’ve been relying on a glycolic acid product for my blackhead removal needs now, though, so I don’t use this anymore and I probably won’t repurchase. What iWhite Korea products have you tried?